On a positive note, following my last post, here's a list of businesses with good customer service. This is obviously not all there are, but ones that spring to mind. So that covers meat, wine, clothes, furniture and lizard consumables (!) - what else matters? It seems to me that so far the Isle of Man has to a certain extent escaped the consequences of the global economic meltdown. The high street still seems buoyant, Douglas nightlife is thriving, house sales although down in numbers are not down in price, and restaurants are busy. I know this because we went out for dinner last night and the restaurant was full, and a couple of others we phoned before to book a table were full without us. However, I've no doubt that at some stage in the near future the crunch will hit, businesses will suffer and people will lose their jobs. So which businesses will go down? No names here, but it'll be those whose customer service skills are below par. For example the jeweller who charged me £12 to change a watch battery - I've not been back since. Ditto the furniture shop who refused to return a deposit after what we'd ordered (based on wrong information from the proprieter) turned out to be unsuitable, and the cafe who didn't let me in because I had 3 kids with me and they only had one table left. In times of economic downturn people stop buying jewellery and new furniture and stop eating out. We have lots of jewellers, furniture shops and restaurants. Some will close down. For ripping me off over the watch battery one jeweller has lost out on several hundred pounds of potential business as now I go to Corlett's. The furniture shop who held on to my £150 deposit has lost out on several thousand pounds of business which has been gratefully received by Juan of Fine Furnishings in Onchan. On a small island like this it only takes a few disgruntled customers and word gets around. I may not have posted the names of the rogue outfits, but I've certainly told people about my experiences. Businesses with poor customer service - be warned. Maths is without question the purest discipline worthy of study, and throughout my school days it was my best subject. I almost carried on with maths at university instead of doing medicine, but what finally made the decision for me was that maths may be fascinating, but at the higher levels of post-graduate maths, it is fundamentally almost certainly pointless. Being a surgeon is probably more useful to humanity. I've always read about maths, and done loads of maths based puzzles, and I always said that one day I'd do an Open University degree in maths. Well I started it in October, and have almost finished my first degree level maths course, and am soon to start the second. If all goes to plan I'll graduate in 2014. So far the course has been fairly easy for me, as I covered most of the material at A level about 20 years ago. I've got scores of 100, 100, 98 and 97 so far - in the latter 2 papers I'm sure the tutor was looking for somewhere to dock me marks. Hopefully the next level course will be a bit more challenging. It's listed on my manxortho.com website that I play classical piano and rock guitar. It's probably more correct to say that I used to play rock guitar, as I rarely pick it up these days. I was pretty good. For most of my 2nd year at medical school I skipped lectures and played for 6 hours a day, and at that stage my technical skills were quite impressive. Since then I've played only occasionally, with long periods of inactivity interspersed with bouts of fairly intense practice. I recorded some tracks about 2 or 3 years ago, and the best of my efforts can be heard on the little iPod touch mock-up in the sidebar. 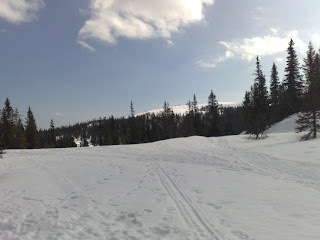 One of the tracks, 'nothing original', is all my own work. By that I mean it's not a tune by an established guitarist, but it's not quite original as the themes are based on Chopin's Fantasie Impromptu, a classical piano piece. As for the rest, 'Adagio' is a famous classical piece on guitar, 'Always with me...' is by Joe Satriani, and all the rest are by Vinnie Moore who is arguably the best instrumental guitarist in the world today. The thing about the electric guitar is that it is not the ideal instrument for others to listen to, and unfortunately for them it should be played loud. I play through a Marshall 60W valve amp with 2x12" speakers - trust me it's loud. So when I play, I may think I'm playing the greatest, most technical solo in the world, but to everyone else it's just a noise. They all prefer the piano, and for now at least I'm concentrating on that. I've been exercising with a Concept II indoor rower for about 7 years now. I started after a fairly unpleasant bout of back pain, when I decided I needed to lose some weight and get fit, and I quickly got addicted to it. For about a year I was fairly obsessive, monitoring heart rate, power output, and plotting graphs of my best times, but now I just work out regularly on it. I bought my own machine just over 2 years ago - cost about £1000, which is about 3 years gym membership, so it's almost paid for itself. I've rowed over 1.5 million metres since I've had it. It's sometimes hard to motivate yourself to get on the thing and row, particularly when it's dark and horrible outside and all you want to do after a full day's work is sit down with a stiff G&T, but I'm sticking with it. Target for the year is to get back to under 7 minutes for 2000m, and under 19 minutes for 5000m. I used to be able to do these sort of times easily, but I'm getting older, and it seems to get harder to maintain performance let alone improve it. At least though I'm slowing the decline. I've played the piano since I was 7 - I can't really remember ever not being able to play the piano. I had lessons between the ages of 7 and 9, and then again from 11 to 12. My technique was always way ahead of my ability to read music, and as a kid I hated practicing classical pieces, so I didn't play much, did grade 4 at age 12 and then gave up lessons. I've recently started playing a bit more intensely, and even treated myself to a nice grand piano. I even had a lesson the other day - first one in about 26 years. Fortunately the teacher is not going to start me off on grade 5, and is happy to work with me to help me improve my technique playing pieces that I want to work on. Current project is Moonlight Sonata, particularly the difficult 3rd movement. When I've got it reasonable I'll post a video. 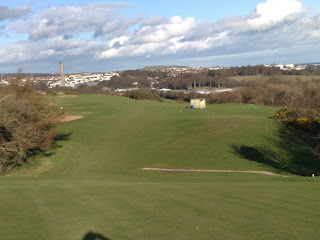 Played a round today at Douglas - teed off around 11.15, weather was pretty fine. When we got to the 6th it started getting a bit windy, a little earlier than predicted by the weather report. By the time we got to the 12th we thought about quitting, but carried on anyway. 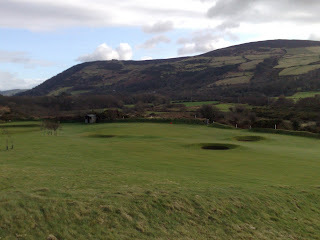 Glad we did as I parred the horrible par 5 13th - my best hole of the day. 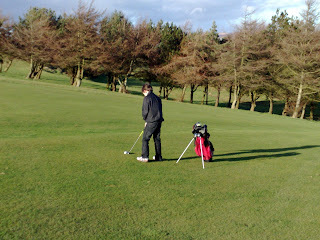 I also managed to land the green on the 17th from the tee - not bad for me. No idea what my final score was - had too many really bad holes to bother to add it all up, including taking 12 for the 9th. Aim by the end of the year is to have a handicap of 18, and at the moment I'd do well to get the maximum 28. A bit more consistency is all I need, as I've now managed to either par or bogey most of the holes on the course. 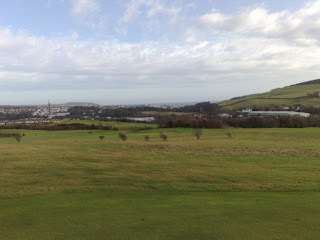 Photo is taken towards Douglas bay from the 6th fairway. Just filled in the details on my profile - well at least what I don't mind others to know. Main issue at work at the moment is the proposed change to the pension scheme. I personally find it difficult to get worked up about, as being a relative youngster I can't quite envisage being retired. I don't believe that changing the scheme will lead to a mass exodus of the medical staff on the island, as most of us are either tied here with golden handcuffs, or would find it nearly impossible to find an equivalent UK job. The problem will come gradually as recruitment suffers. For a non-Manx person to come to work on the IOM is a leap into the unknown at the best of times, and I certainly had doubts 3 or so years ago. If I'd had to come to non-standard terms of work it probably wouldn't have happened. Government, be warned. 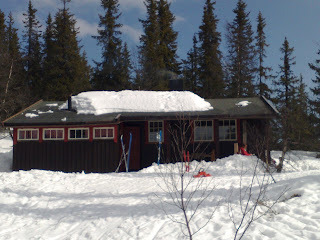 Just set up the blog, don't know what to post really. Planning to include progress with my maths studies, golf, piano playing, and maybe work related stuff, but obviously I'll have to be careful there. I'll see how it goes anyway.